I’m totally the type of person who, if it were socially acceptable, would outfit everything in my house with ‘the clapper’. In fact, if someone invented one that cooked dinner and made cocktails, I’d be flamenco-ing myself silly. What I’m saying is, I don’t really like to make extra work for myself. Even though I obviously enjoy cooking, I’ve never been tempted to make my own ketchup. Heinz already rocks that market. Make my own Worcestershire sauce? Um… no thanks. Mayonnaise? That’s another story. Now I know some people detest mayo with a white-hot passion but I am not one of those people. I like it just fine. In fact, I like the store-bought kind just fine. Give me Hellmann’s (Best Foods to those of you on the west coast) on a sandwich or in potato salad and I’m perfectly happy. But there are times when a little extra work really pays off. In this case, with a little whisking, you can have a bright, lemony, garlicky homemade aioli in just a few minutes. It’s so easy and definitely worth it. So what, technically, is the difference between mayo and aïoli? I’m glad you asked because, like you, I roll my eyes when recipes use the term just to make a dish sound fancy. Yes, we all know those ‘Crispy potato slivers with herb aïoli’ is really just french fries and mayonnaise with chives on top. We all want it anyway but let’s not pretend, shall we? Mayonnaise is basically an emulsion of egg yolk with a neutral-flavored oil like canola, and vinegar (or lemon juice). 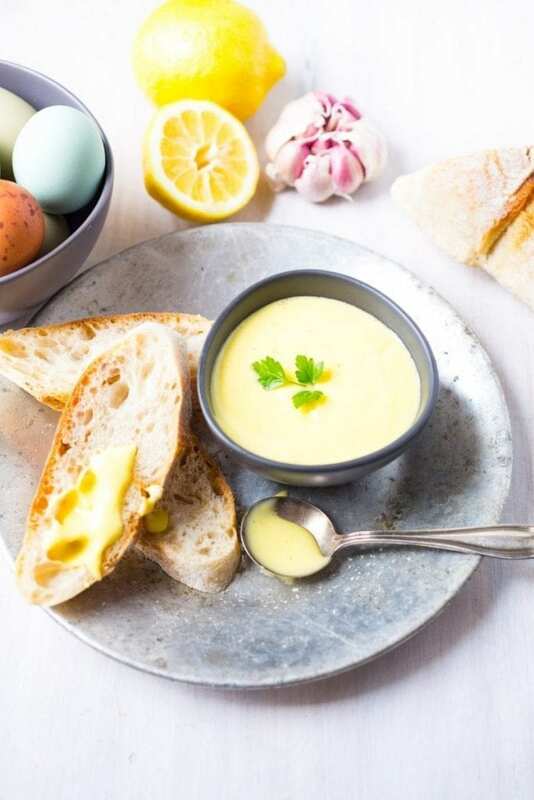 Aïoli, on the other hand, is a southern French sauce that is also an emulsion of egg yolk and oil, but it also has garlic, lemon juice and sometimes mustard. It’s often assertively flavored and the oil is usually all or part olive, giving the sauce a recognizably fruity aroma. Similar, not the same. Place your bowl under a dish towel, set in a pot and begin whisking. The pot will keep the bowl steady. Drizzle the oil in very slowly at first, whisking constantly, until an emulsion forms. Once it thickens up, you can pour a little faster as long as you keep whisking. Once all the oil is incorporated, add the lemon juice and any other seasonings you want. 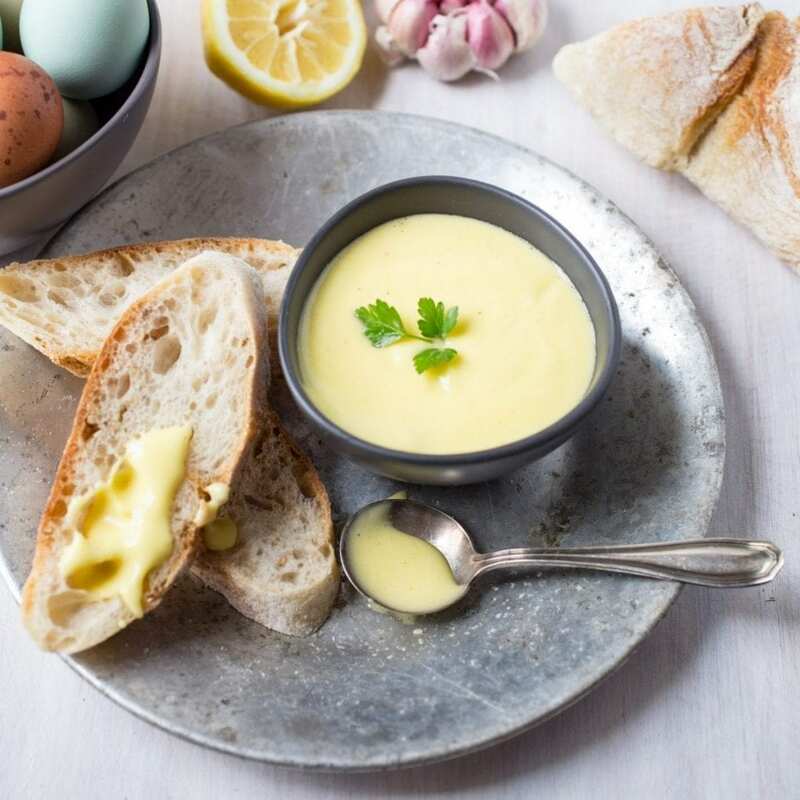 Your homemade aioli can be used as a dip (with Steamed Fingerling Potatoes), or a sauce (with grilled or poached shrimp). We used it slathered on toasted bread to go with our Steamed Mussels With Wheat Beer and Basil. 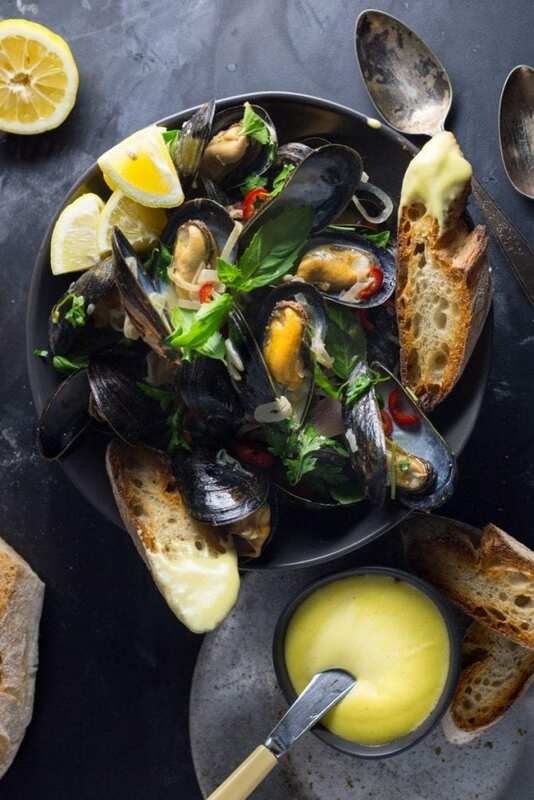 Beer-Steamed Mussels with Garlicky Aïoli Toasts. Oh yes. Drape a kitchen towel over a small saucepan and set a small metal bowl over it (this will hold the bowl in place so you can whisk and pour at the same time). Whisk egg yolk*, garlic, ¼ tsp. salt, and 2 tsp. water in metal bowl to blend well. Whisking constantly, slowly drizzle in grapeseed oil, 1 teaspoonful at a time, until sauce is thickened and emulsified. Whisking constantly, add olive |oil in a slow, steady stream. Stir in cayenne, paprika and lemon juice, season with pepper, and more salt, to taste. *Raw egg is not recommended for infants, the elderly, pregnant women, people with weakened immune systems. If you’re concerned, use pasteurized egg yolks instead. I just made this to put on BLT sandwiches. So good! Thank you.